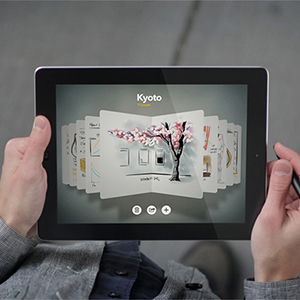 Papermaking is a highly sophisticated process involving several processing steps to turn wood into paper products. In addition to the actual papermaking process, there are also supporting areas such as waste water treatment, recovery boiler operation, steam production, and cooling towers that benefit from on-line analytical measurements. 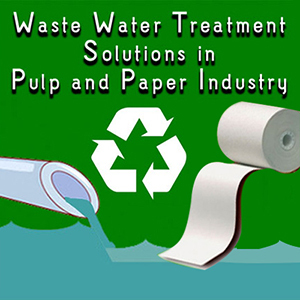 In the Pulp and Paper industry a lot of effort is used to water saving and closing water circuits, and to reduce substantially the environmental impact, by process modeling and Kidney technologies as internal process water treatment. Effluents from pulp and paper mills contain solids and dissolved matter. Principal methods used to remove solids from pulp and paper mills effluents are screening, settling/clarification and flotation. The method chosen depends on the characteristics of the solid matter to be removed and the requirements placed on the purity of the treated water. The separation of solids from the effluents is accomplished with help of screens, grid chambers and settling tanks. Screens are units which operate according to the sieving/filtration process. The function of the screens is to remove coarse, bulky and fibrous components from the effluents. The grit separating systems currently in use are subdivided into longitudinal grit traps, circular grit traps and vortex grit traps, depending on their design and process layout. The paper industry uses a variety of effluent treatment systems. The preferred process combination for each individual case depends on the grade-specific quality of the effluent that is going to be treated. Sedimentation technology is the simplest and most economical method of separating solid substances from the liquid phase. High efficiency is achieved in subsequent effluent treatment processes when the solid substances suspended in the effluents settle in a sedimentation tank as completely as possible, and settled sludge is removed from the sedimentation tank. Sedimentation equipment with sets of lamella-shaped passages, are employed in the paper industry, especially for effluents with high fibre concentrations. Biological waste water treatment is designed to degrade pollutants dissolved in effluents by the action of micro-organisms. The micro-organisms utilize these substances to live and reproduce. Pollutants are used as nutrients. Prerequisite for such degradation activity, however, is that the pollutants are soluble in water and non-toxic. Since the early 1980s, anaerobic treatment of industrial effluents has found widespread application in the pulp and paper industry. Several hundreds of installations are treating a large variety of different pulp and paper mill effluents. Anaerobic treatment is most commonly used for effluents originating from recycle paper mills, especially during production of containerboard. Moreover wastewater of mechanical pulping (peroxide bleached), semi-chemical pulping and sulphite and kraft evaporator condensates may be treated. Aerobic micro-organisms require oxygen to support their metabolic activity. In effluent treatment, oxygen is supplied to the effluent in the form of air by special aeration equipment. 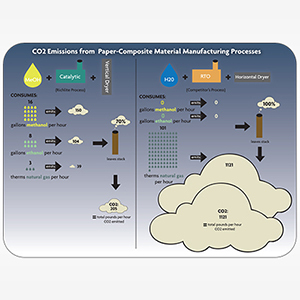 Aerobic treatment allows fully biological degradation of paper mill effluents. Aerobically operated plants exhibit higher plant stability and are less sensitive to fluctuations in effluent and plant parameters. Secondary clarification is intended to separate the biomass (activated sludge) formed in biological reactors and is therefore a key element in all processes employed in the final stage of a treatment plant. The quality of the separation process is just as crucial for the final effluent quality as is biological treatment itself. Tertiary and advanced waste water treatment is used to remove specific waste water constituents that cannot be removed by secondary treatment. Different treatment processes are necessary to remove nitrogen, phosphorus, additional suspended solids, refractory organics or dissolved solids. Sometimes it is referred to as tertiary treatment because advanced treatment usually follows high-rate secondary treatment. However, advanced treatment processes are sometimes combined with primary or secondary treatment (e.g., chemical addition to primary clarifiers or aeration basins to remove phosphorus) or used in place of secondary treatment (e.g. overland flow treatment of primary effluent). Advanced waste water treatment in the pulp and paper industry is focused mainly on additional biological membrane reactors, ozone treatment and membrane filtration techniques such as micro-, ultra- or nanofiltration and reverse osmosis. Filtration Assisted Crystallization Technology (FACT) is a hybrid process, patented by TNO, combining heterogeneous crystallization and a simple filtration. The heterogeneous seeds should allows fast crystallization and easy filtration. Veolia has developed and used advanced precipitation processes with sludge recirculation including forced-circulation, draft-tube crystallizers with custom mixers that yield very high circulation to minimize supersaturated zones. Especially, in the Pulp and Paper industry, the removal of scaling compound, called calcium carbonate, is a key point in the perspective of a re-use of the wastewater. According to crystallization theory, precipitation is defined as a “reactive crystallization”. This definition is preferred as it emphasizes the formation of the solid product via a chemical reaction. Electrodialysis is an electrochemical membrane separation technique for ionic solutions that has been used in industry for several decades. It can be used in the separation and concentration of salts, acids, and bases from aqueous solutions, the separation of monovalent ions from multivalent ions, and the separation of ionic compounds from uncharged molecules. Evapoconcentration is a unit operation which consists in the separation of two liquid constitutes: the removal of solvent (generally water) as vapour from a solution or slurry. The aim of evapoconcentration is to obtain a very clean distillate which could be rejected in the nature, sent in a sewage treatment plant or reused. Evaporation has proven to be a very efficient and reliable technology for treatment of industrial waste-water mainly due to its flexibility in the treatment of very different types of wastes, with a very high load of pollutants. Chemical flocculation process is a crucial process as it promotes the aggregation of particles after being destabilized by a chemical agent. In pulp and paper industry, flocculation is involved in different parts of the process: it is essential to form the paper sheet in the forming wire, determining retention, drainage rate and the formation, and it is also used in the wastewater treatment to separate the colloidal material and in the sludge thickening. Today Ozone and UV are well known and proven in the field of water and waste water treatment ozone as multifunctional powerful oxidant and UV as best available technique for disinfection regarding treatment results, plant design and cost. The main goal of these combined processes is to enhance the oxidation potential. Combined chemical (AOP) and biological oxidation processes are well-known for removing recalcitrant and anthropogenic substances from wastewater. Additionally the decolourisation with ozone has already been established as an application of polishing of biological treated effluents. Membrane treatment in P&P-industry serves to optimize loop closure and therefore helps to reduce fresh water intake as well as wastewater treatment. Other purposes of membrane processes are: improved product quality because of lowered pollution of loop water, re-use of treated effluent in production, recovery of valuable substances e.g. coating pigments and minimizing environmental impact because of improved effluent quality. Full scale membrane filtration of Pulp & Paper effluents has been already installed in some mills. Nanofiltration treatment of total effluent was installed in a newsprint paper mill several years ago. The advantage of NF in the recovery of water for recirculation is mainly that the clean water can be used even in the most demanding places in the paper mill. There is currently growing interest in the MBR (membrane bioreactor) process in municipal and industrial wastewater treatment. MBR is used in the paper industry as end-of-pipe technology as well as process integrated measure for the reduction of the concentration of detrimental substances in the water circuit. Especially in terms of effluent quality and economical aspects a MBR is a sustainable technology for the industrial wastewater treatment. The purpose of water filtration is to remove particles and colloids which either disturb the industrial process, deteriorate the quality of the final product or support bacteria and viruses that are a danger for human health. The 3FM® system (Flexible Fibre Filter Module) is a new high speed filtration device that can be substituted for conventional solid-liquid separation process such as coagulation, settling and sand filtration. Ultimately, the solutions to the profound challenge ahead – the shifting of industry awareness and the transformation of the industry’s lifeblood – requires continuous research and technology to be developed in the years to come.